YouTube can turn anyone with a camera into an eyewitness reporter, but that can be a problem when the subjects of the video need to stay anonymous. 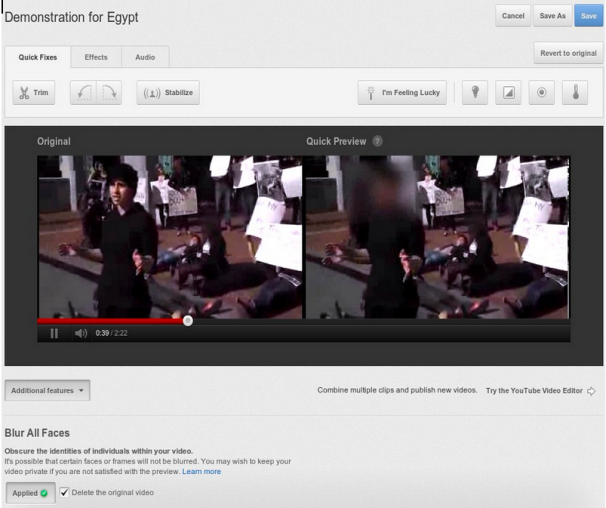 To address this issue, YouTube has added a face blurring option to the site's built-in photo editor. When users apply the option, YouTube tries to detect and blur all faces automatically. The option appears under “Additional Features” in YouTube's Video Enhancements tool. “Whether you want to share sensitive protest footage without exposing the faces of the activists involved, or share the winning point in your 8-year-old’s basketball game without broadcasting the children’s faces to the world, our face blurring technology is a first step towards providing visual anonymity for video on YouTube,” Amanda Conway, a policy associate for YouTube, wrote in a blog post. A selective blurring tool might be more useful, as it would allow willing participants in a video to be identifiable while keeping bystanders anonymous, but Conway didn't say whether that type of feature is in the works. In a separate post on Google's Public Policy Blog, YouTube Director of Global Communictions and Policy Victoria Grand outlined a few more ways that users can protect themselves. Users should consider the risks that uploaders and subjects may face, and be mindful of other information that can give away someone's identity, such as recognizable voices, spoken names, license plates, name tags and background scenery. Grand also noted that local laws may allow authorities to track the source of mobile uploads, and that in some countries, a SIM card purchase can lead to government tracking. “Of course, anonymity is never a guarantee, and people who capture sensitive video footage should consider taking other precautions to keep themselves and their subjects safe,” Grand wrote.